Hello! 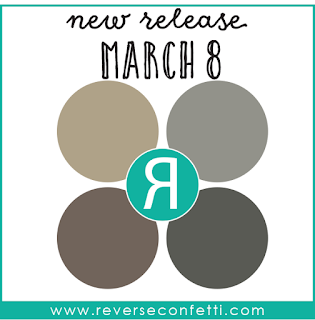 It's the first day of Reverse Confetti March sneak peeks, and today I'm sharing a card created using the new Boho Vibes stamp set, and the Tall Triangles Confetti Cuts and Wild Words Confetti Cuts dies. 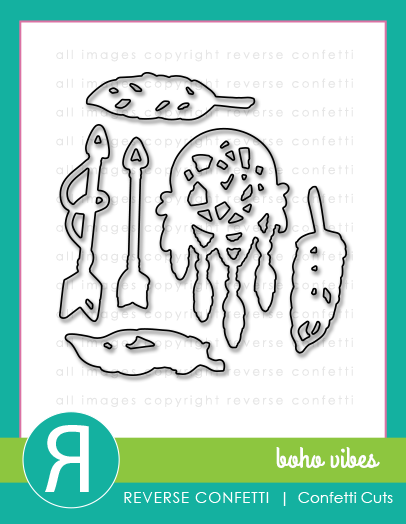 To create my card, I started by first die cutting several Tall Triangles Confetti Cuts from Stormy, Stone and Cloud White cardstock. I then created a pattern with the individual chevron pieces and adhered them to a Lead card base. 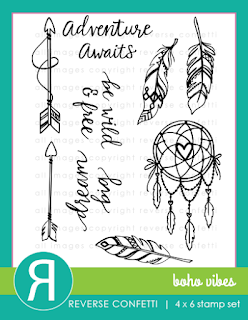 Next, I stamped the feather images from Boho Vibes in Stormy ink onto Stone cardstock, then cut them out with the coordinating Boho Vibes Confetti Cuts. The focal sentiment was die cut using the Wild Word Confetti Cuts on Iced Aqua cardstock, and adhered to the front of the feather die cuts. 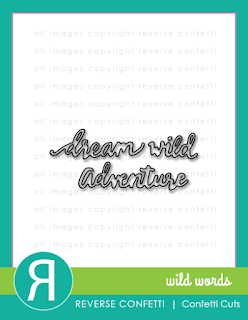 The remainder of the sentiment was created by stamping letters from the Alphabetical stamp set in Stormy ink onto white CS. To finish up the card, I adhered the sentiment pieces together, attached them to the card front with foam tape, then embellished with matte aqua enamel dots. The tall triangles and feathers are really cool together! LOVE how you used those triangles. So cool! Heather, this is gorgeous! The way you used the Tall Triangles is brilliant! Love the combination and way you used these new supplies! WOW - really eye catching! Gorgeous! I love how you used those triangles and the pop of color is perfect! What a clever way to use the triangles!! Love! Oh Heather, this is gorgeous! The aqua is a fabulous addition! Aqua is the perfect touch with the new color palette! This is gorgeous! 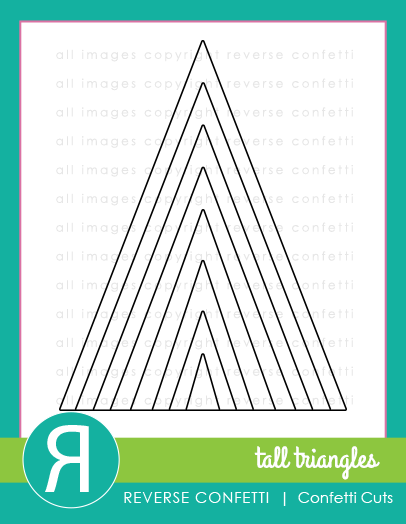 I love those triangles..what a fun accent! Gorgeous colors too! This is my first reveal-but not my first look at RC designs. The way you used the tall triangles were very smart looking. Didn't think I'd care for he die-but you changed my mind!! Awesome card! I like how you used the triangles coming in from the sides of the card! Striking card! I like the graphic design and neutral color choice. 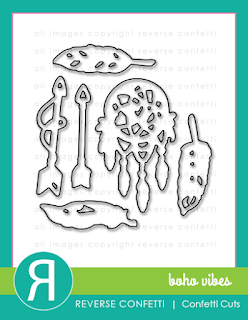 amazed to see the details of the boho vibes set! great card!! Great details on this stunning card! 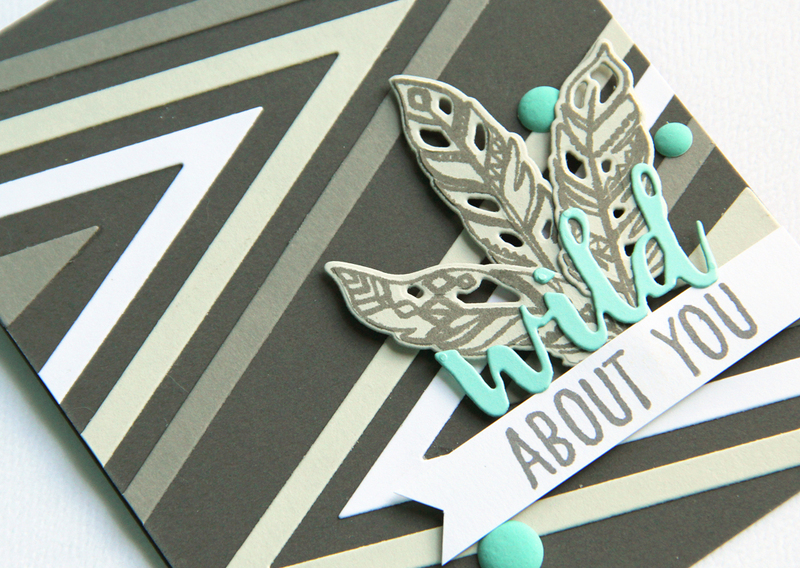 Wonderful graphically bold card and softened by the feathers! Wonderful card! Love the new triangle dies!! The colors are amazing and the creativity is great! Awesome card! Love the triangle cuts coming from both sides in combination with the feathers. Very pretty. Great way to use this die...gives it a totally different look! I just love the aqua with the grays. Very unique. I love the colors, details, and design. Another great release! I like the neutrals you used. The tall triangles are really cool and modern! Love your color scheme too. Love the colors and how you used the Tall Triangles as background. Great card! This is so beautiful card! Love the colors. Love these new colors on your cool card! wow!!! your card is absolutely amazing!! love how you used the triangle dies!! Pretty card! I love the new colors and the Tall Triangles! love your color combo and the design! Such a great card! 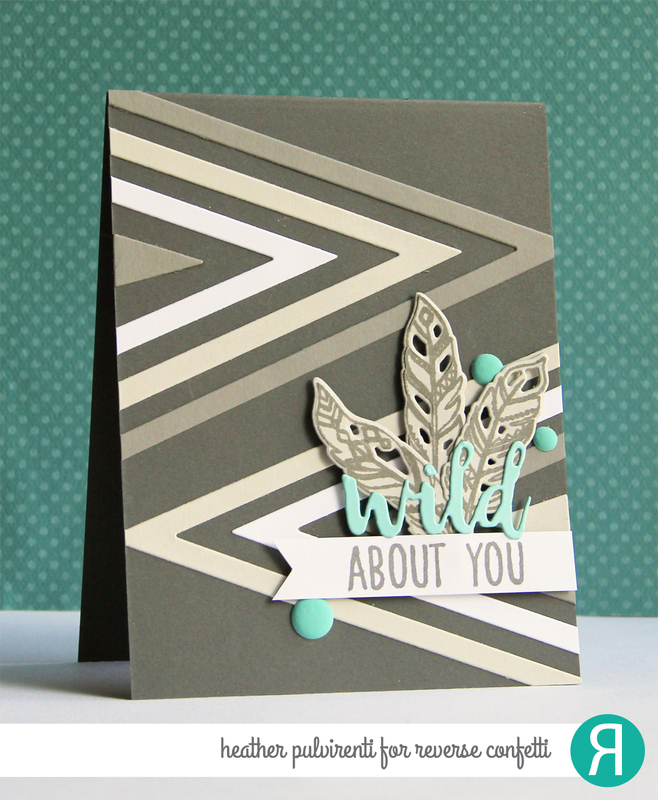 Love how you used those triangle dies! So bold and graphic, yet soft and pretty! Love the graphic look of the triangles. Bold and graphic design. Brilliant. Such an awesome card! Loving this release! 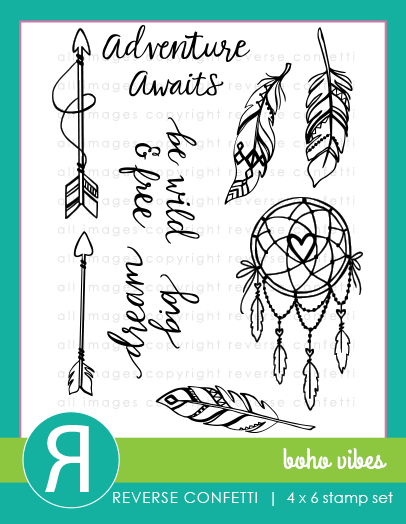 Love your card and I love that boho stamp set! the colors are muted but make a bold statement. Love geometric designs on cards!! This is beautiful and brilliantly done! The giant chevies look wonderful on this fabulous card! Beautiful!!! Oh I love the design you've created! 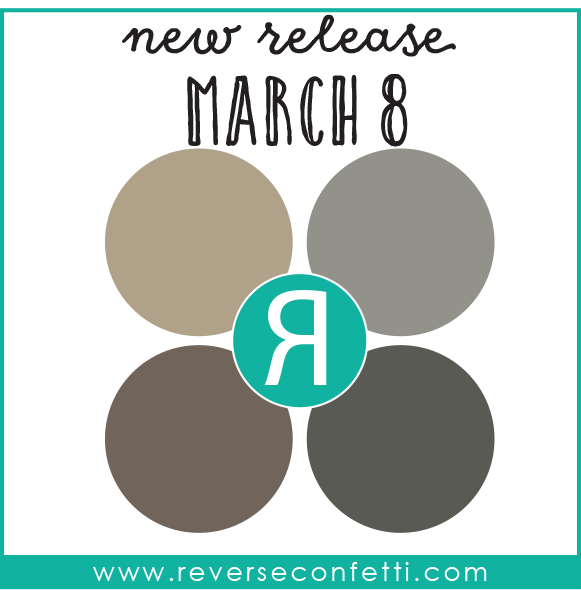 you choose and amazing color combo for your card!